As a Newport Wedding Photographer I have had the pleasure of taking part in wedding events at a variety of Rhode Island venues. Some of the most precious moments to capture as a Newport Wedding Photographer are from the time the bride and groom spend in preparation for the day. 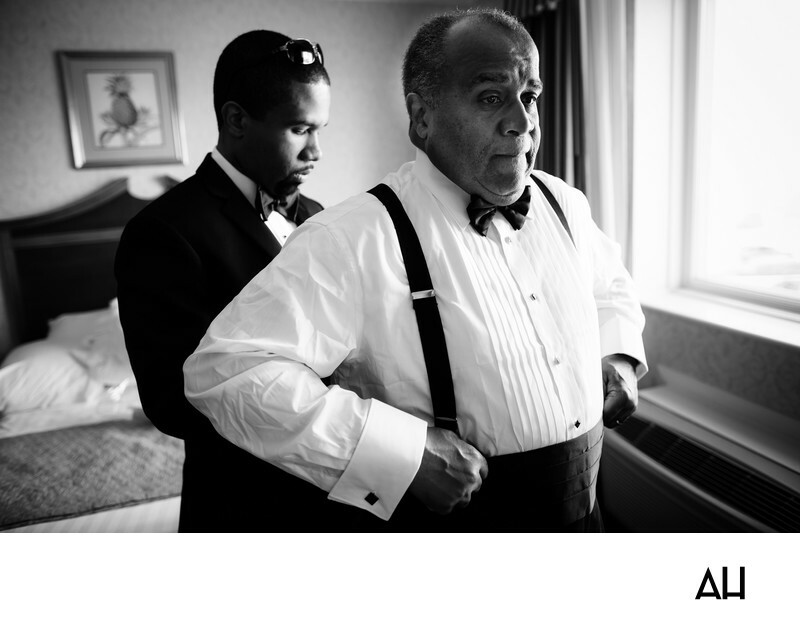 This picture from a Rhode Island wedding shows the groom helping his father adjust the cumberbun of his tuxedo. It is still early in the day, with faint early afternoon light streaming through the wide hotel window. The groom is all ready for the ceremony, with every piece of his tuxedo in place. Now, he takes time to give his father some assistance as they chat about the events that will follow this endearing moment. The black and white photograph gives the impression that the picture has no sense of time. The image is one that has been, and will continue to be, seen for years. A father and his grown up son, getting ready for the son’s wedding day. It is a proud moment for the father of the groom: he knows he has raised a man who will love and cherish his wife as long as he breathes on this earth. That is the type of marriage the groom’s father and mother demonstrated for him. In the image the father fixes his suspenders, looking into the mirror before him, not at himself, but at his son. They don’t say much to one another, but this is a moment that means a great deal to both the groom and his dad. After today, the groom will be on his way to starting a family of his own, and with the memories of his own parents guiding him. As a Newport wedding photographer, there are so many great wedding venues to photograph at including Castle Hill, Forty 1 North, 12 Meter Charters, Aldrich Mansion, Eisenhower House, Newport Marriot, Newport Yachting Center, The Chanler at Cliff Walk, Regatta Place, and Hyatt Regency Newport.